…gave it away. Apparently, there exists an immense Reiatsu and impressive technologies among the shinigami that could be used against Yhwach, yet here they are, still in Seireitei with no idea of what is going on in the Soul King’s Palace. Oh well. Then, here come the Quincies/Sternritters with NaNaNa Najahkoop attacking Aizen. I wonder what happened to Aizen? That is one thing I do not like with Bleach: it is not clear what happens to a character after being hit. Countless shinigami were attacked/hit in this war, and we do not know if they survived or not. Anyway, I was getting pumped up to see Shunsui Kyōraku getting ready to attack the Quincies/Sternritters. I thought he was going to do it alone and I thought that this is going to be awesome and that finally, we would see Kyōraku in action. BUT NO! NaNaNa Najahkoop gets backstabbed (more accurately: shot from the back) by Bazz-B! And apparently, they want to help the shinigami get into the Soul King’s Palace! I was like, WHAT!? A rebellion among the Quincies/Sternritters! Well, it was bound to happen. But man! I would have wanted to see Kyōraku dish it out! Maybe we will get that in the near future. I am still wondering what happened to Jūshirō Ukitake. 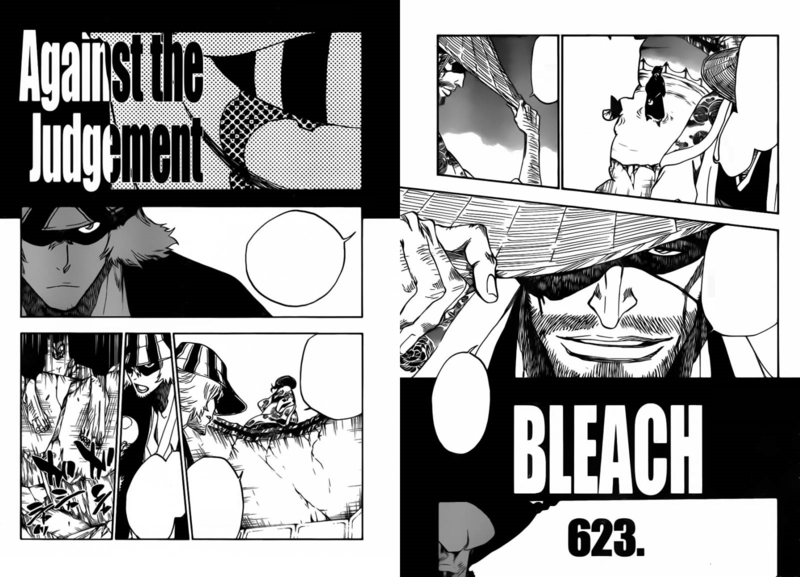 It is annoying that in Bleach, priorities are set very differently from what we perceive as important. You could be dying next to the Gotei 13, and their attention would be diverted towards a traitor restrained to a chair or to a blinding flash of light followed by dark creatures coming from it. Then again, this is a war; it’s every man for himself. Still, I wish we had a clue on what is going on with everyone! Chapter Disappointment: Kyōraku’s supposed battle scenes and being kept in the dark about what happened to Ukitake and Aizen. Chapter Approval: Possibilities and a ray of hope with the abandoned Quincies/Sternritters wanting to join the shinigami. Chapter Cliffhanger: The decision of the shinigami on the abandoned Quincies/Sternritters’ bid to join them. Hopefully, next chapter, we would see what is going on in the Soul King’s Palace. Also, we would like to see what Aizen’s actions will be and what has become of Ukitake.